This is a set of make up tools. The make up brush is made of soft material. Wavy texture and hollow design ensure the brush washer&apos;s cleaning effect. They will be your perfect make up tools, why not have a look now? It contains a make up brush and a cleaning tool for washing make up brushes. 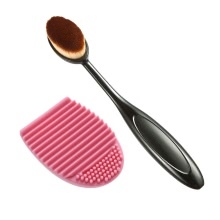 The make up brush is soft, more convenient to use. Wavy texture of the brush washer can help you clean more thoroughly. Hollow design makes the washer possible to put your fingers in, which is more flexible to hold. This product is small and light, suitable for both outdoor and home use.